Almost sounds like another Agatha Christie novel, doesn’t it? But all of the lingerie sewers who read my blogs will in this case think of BRA cups rather than murder … Still a true mystery though, because what on earth is a Sister Cup? While working on my latest Mini-Mourse ‘Design your own Large Cups Bra‘ it seemed essential to explane the Sister Cups concept there. But since it also applies to almost any bra wearing woman I thought it would be a good idea to share this information in a FREE printable available to download for everybody. So, this mysterious Sister Cup … basically it means some very different sizes bra can still have exactly the same cups! When buying a bra the size you always wear might not be available and the saleswoman pops up with a very different size in both band and cup letter. And guess what, it works! That will be the Sister Cup bra. These lovely ‘sisters’ wear the same type of bra in a different bra size. One is a very slim woman while the other is more well-rounded. They can’t possibly share the same bra you would think. True, BUT looking closely the cups of the bra are the exact same size! This must be the same cup letter? Eh, no it isn’t … because the bra letter doesn’t represent a fixed mass but only the difference between the measurement right under the bust and the measurement over the fullest part of the bust. What happens when the measurement of the number (=band size) drops but the cup (breast) mass will stay the same? The difference between the full bust measurement and the underbust measurement will be more and the cup letter will be higher. What happens when the measurement of the number (=band size) rises but the cup (breast) mass will stay the same? The difference between the full bust measurement and the underbust measurement will be more and the cup letter will be lower. Does this mean all bras with Sister Cups share the same cup (or breast) mass? 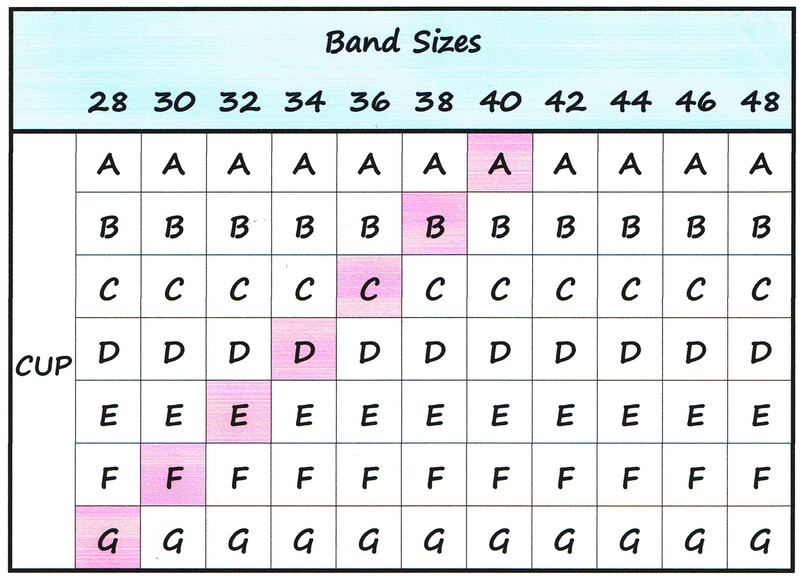 In the Sister Cup Chart below the pink sizes from 40A up to 28G have the same cup mass and use the same cup pattern but do not share the same cup letter! To find the bra size with a sister cup you keep going one band size down + one cup letter up (the band will be more tight). Or the other way around of course, one band size up + one cup letter down (the band will be more loose). Bras close to each other in this chart might be an option to wear when the the desired bra size is not available. Still confused? Understandable! 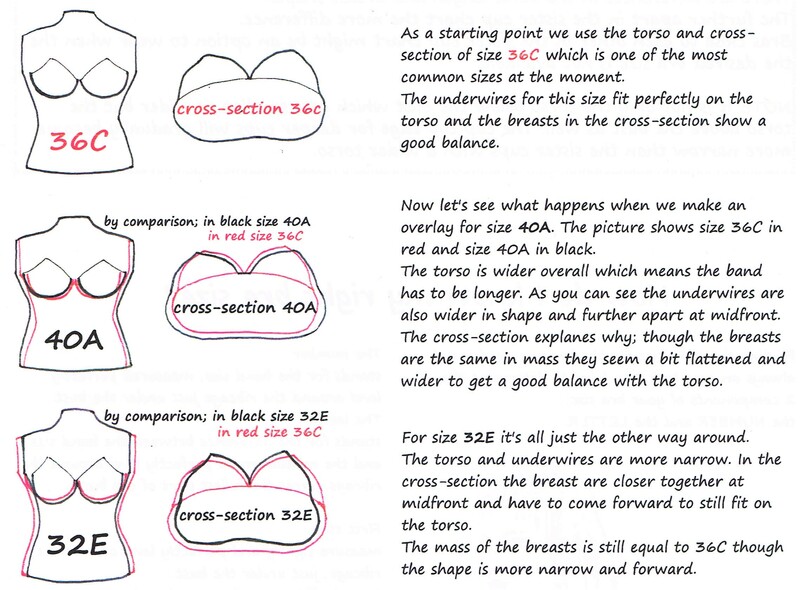 Let’s visualize some Sister Cup sizes on torso and in cross-section to compare the differences, this might help to understand this confusing matter. It shows the different shapes of the breast in Sister Cup sizes. The mass of the breasts (cups) will be the same but is gradually divided differently over the torso. On wider torsos the breasts will gradually flatten in each size to keep in balance with the torso while on slimmer torsos the breasts will gradually point more forward. As a consequence you can only exchange Sister Cups bras when they are close to each other in the Sister Cup Chart. The further apart in this chart the more difference in shape of the breasts. For us bra making lovers it also means more adjustments to the cup patterns! You can download and print the new FREE Sister Cups PDF to read and understand all about it. This entry was posted in free downloads and tagged bra cup comparing, bra cup difference, bra cup sizes, bra making, bra sister cups, bra size comparing, bra sizing, free download, free printable, what is a sister cup. Bookmark the permalink.